I Remember – the memoir of Adeline Hodges. Born on 20th May 1899 in Dawdon, County Durham, Adeline Hodges was one of nine children raised at number seventy Swinebank Cottages. 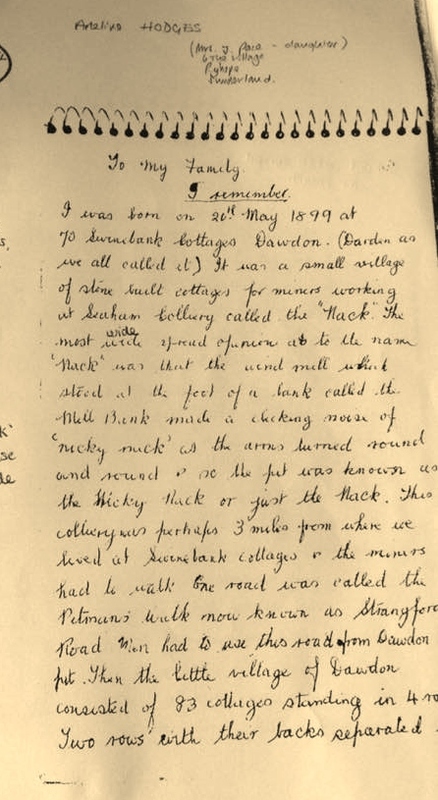 Her father was a stone man ‘down the pit’ at the nearby Seaham Colliery, known by locals and workers as the ‘Nack’. Her mother was a housewife, dedicated to making ends meet and providing a poor but happy life for her children and husband. The memoir is in two sections. The first is Adeline’s recollection of her childhood years, mainly based around her life in Dawdon. She tells anecdotes of daily life in the village, discussing topics such as religion, education and schooling, transport, and characters in the community, for example the local policeman, ‘the village bobby…was a big, strong fellow, magnificent in his uniform. He was a friendly, fatherly figure, but mind you everybody had the greatest respect for him.’ (pg. 62). The sense of community really stands out in Adeline’s memoir. She writes of events such as christenings, weddings and parades in which the whole village took part, in these we see local traditions being carried out and in the memoir they live on. The theme of gender roles is also clear, as Adeline explains how women were expected to stay in the home, while the men played sports and went to work. I will explore this further in my research. Swinebank Cottages from the North, taken in 1870. The second part of the memoir focuses upon life after Dawdon, when the family have moved to Seaham- a larger mining town a short distance away. Adeline writes about her father’s death, and how this affected her. She also goes on to tell us of how she becomes a student teacher and the courtship with her husband Ben. World War One also becomes a predominant subject of the second section, as we learn how it affected not only Adeline, but the community she lived in. I look forward to examining both parts of Adeline’s memoir, and sharing my findings on this blog, as I believe her writing will be able to tell us so much valuable information. Adeline Hodges’ memoir first intrigued me when I saw her entry in The Autobiography of the Working Class: An Annotated, Critical Biography (1984). The vast amount of topics that she discusses were listed here and I knew it would aid me in learning more about everyday working class life. After reading just a small section of her memoir I was drawn in by her descriptive writing style and the vivid imagery of even the less significant events in her childhood, for example, she describes a game of ‘funerals’ in detail, ‘One child would lie on the grass full length with arms duly crossed on the chest, and the other children would heap grass and flowers on top of him. We made wreaths and crosses of daisies, buttercups, dandelions, bluebells, cranesbill, ladies fingers cowslips and many more.’ (pg.7). 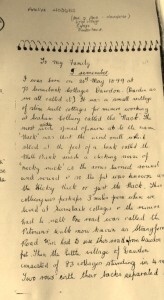 The memoir is addressed at the beginning, ‘To my Family’. This interests me as Adeline is obviously writing with the purpose of sharing her life with the next generation of her family. As her memoir is handwritten, rather than typed, it feels even more personal when reading. You can see the changes she has made and the words she has replaced- she is her own editor in this sense, allowing her personality and opinions to shine through in her writing.